If you want to join the ranks of successful entrepreneurs, you’ve got to figure out one big thing: how to attract a steady flow of buyers into your business. And when it comes to attracting new customers, there are so many marketing myths that can get in the way of your success. The truth is that when you attract a group of people who actually WANT to buy what you’ve got, it’s a lot easier to grow your business quickly (and profitably!) without feeling like you have to spend your life marketing and selling yourself. But it’s not as easy as just saying “go find your people,” right? Maybe you’re one of those people who doesn’t know WHO to target because you can help so many different kinds of people with your skills and capabilities. Or you could be one of those people who knows EXACTLY who your dream buyer is but you’re not sure WHERE they’re hiding or if they even exist. Or maybe you’ve already found an audience, but they all seem to be freebie hunters who grab their wallets and run the moment you offer anything for sale. With all the tools, insights, and resources available today, why is it so darn hard to find and attract the RIGHT people so that your business is always full of eager new buyers? You’ve been hustling your buns doing a ton of marketing, but it’s hard to know if (or where) your tribe is hiding out and if they’d even want to buy what you’ve got. You’ve spent time and money on “proven” marketing strategies in the past that were supposed to attract the right audience, but so far, nothing has worked. Now you’re wondering if there’s some secret that you weren’t told. You want to attract an audience of people who love and want to buy from you, but you’re just not sure where to start. The truth is, committed entrepreneurs like you and I can’t afford to sit around hoping the right people find us online so that we can profitably and predictably grow. If you’ve ever launched anything (a new freebie, a course, a program, or a service) online only to have days and weeks go by with little to no takers, you’ve already encountered that mean voice in your head whispering that you’re not good enough. Well, that voice is a liar. You're good enough, but there’s just a whole lot of bad advice out there. In my experience, there are three common marketing myths that are to blame when you just can’t get the traction you want with your product or service. Today, I’m going to bust those myths and show you what to do instead so that you consistently have a parade of profitable buyers streaming into your business and so you can grow your business without ever feeling salesy, pushy or desperate. 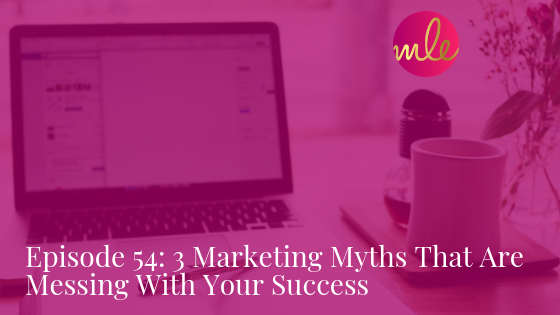 Here are three marketing myths that cause your marketing to flop and what you can do to attract a steady flow of eager buyers into your business. Many entrepreneurs think of their audience as literally anyone with a pulse and a wallet. Or maybe they’ve narrowed it down to a (still very broad) group, like any moms, runners, or corporate professionals. These entrepreneurs think they’re being smart and savvy by targeting a broad audience with their marketing efforts. Having a broad audience creates a problem. When you talk to a broad group of ‘everyone,’ you’re actually talking to nobody. Your message is so generic that your audience ignores it. There’s a big difference between a first-time mom with an infant and a mom of three dealing with the dreaded 4 Ds of raising teenagers: driving, drugs, devices, and dating. I know, because I’ve been a first-time mom of an infant. And, now, I’m a mom of a teenager dealing with the 4 Ds. Daily. The same is true with YOUR audience. All of these phases must tap into a specific problem that your perfect audience already wants to solve. When you get super specific about WHO your audience ACTUALLY is and what they’re struggling with, then you build a marketing funnel system to attract and engage them automatically, everything will change in your business. You’ll begin attracting the right people with content that engages your perfect audience. You’ll notice your audience paying attention to what you create because it’s speaking directly to their situation and shows that you understand who they are. You’ll suddenly have eager buyers swarming around your offers because you’ve taken them on a journey from pain to possibility by directly speaking to their big, burning desire. This ONLY happens when you know EXACTLY who you’re speaking to and WHAT pain they want to solve. When you do this right, you’ll create a predictably profitable business with a marketing funnel that becomes your 24/7 audience-engaging sales machine. Best of all, this frees you up to focus on the work you do best. How many times have you heard someone say, “Give your audience such valuable information that they would pay you for it”? I’m sure you’ve heard that bit of advice floating around. The problem is that most of us think that ‘value’ means we have to teach our audience to become experts. Or worse, we’re trying to prove that WE are experts. We’re trying to show that we know our stuff by sharing valuable tips, how-tos, and tutorials, and we think that’ll convince them to come buy from us. What happens instead is that we drown our audience with tons of well-intentioned, highly valuable information that they don’t pay attention to because they’re not yet ready for all the details. When we do that, it means the very people we WANT to attract ignore us because we’re too overwhelming, detailed, or information heavy. We’re literally drowning them with our valuable content. Information alone doesn’t help anyone. What your audience REALLY needs is something else entirely. They need stories, not how-tos. They need examples, not tutorials. They need to believe that the results they want ARE possible, not just in theory. They need to believe that you're the person/business that will help them actually get those results they now desperately want AND believe are possible. THAT is what is valuable to your audience. Then, and only then, will they be ready to pay attention to all your great teaching. But that sort of thinking brings up a really important question. When was the last time you read a blog post, listened to a podcast, watched a video, attended a webinar, went to an event, or even got an email filled with such valuable info that you dropped everything until you figured out how to give that person money even though they didn’t ask you to buy anything? You’ve got to create an easy, non-salesy way for your audience to go on a journey with you. A journey that demonstrates that you get your audience and know their pain, struggle, and desire. A journey that shows what’s possible on the other side of those emotions. They need a clear offer to buy from you so that they can get to their big, burning desire. If you’re reading this post right now, you’re in a GREAT position to stop all the hustle marketing tactics that take a ton of effort and don’t actually bring you a steady stream of clients. Instead, you need to dive into a much more strategic approach before your competitors do so you can fuel your business by attracting the right audience and crafting the right journey so that they’re eager to buy from you. Even if your competitors are using marketing tactics that seem exciting, you can gain a significant competitive advantage by being the first to build a complete marketing funnel system that starts at your buyers’ pain and creates desire for your offer. Now that you know the three myths that cause marketing efforts to flop, I’ve created a detailed, free guide to give you the behind-the-scenes shortcut to get YOUR marketing funnel up and running fast. My goal is for you to avoid all the marketing hustle that keeps you busy but doesn’t build your business into being predictably profitable. I want to help you crawl into your audience’s mind to create a buyer-attracting engine that fuels your business for years to come. I’ve been building marketing funnels for over five years now, and I’ve made a ton of mistakes along the way. A big one was not knowing how simple it can be to get a marketing funnel up and running. That’s why I’ve created this guide so that you can download these 5 proven marketing funnels to easily attract new clients and start transforming your business TODAY.